Ecuador is facing an unprecedented confrontation between a ‘progressive’ left-leaning government and a national coalition of indigenous peoples determined to stop vast oil and mining projects taking place on their community land and villages. Ecuador’s umbrella organization representing the country’s Tribal Nations, CONAIE, has declared a National Mobilization to oppose a wave of oil and mining projects that threaten tribal territories across the country. The declaration comes in the wake of increasing hostility by Ecuador’s government against the indigenous people resisting large scale resource extraction on their ancenstral lands. The government has announced a ‘national security alert’. At present more than 200 Tribal National leaders are under investigation for terrorism – relating to the growing popular resistance to polluted water and environmental destruction arising from extractive industries. The government of the ‘progressive’ and left-leaning President, Rafael Correa, is pushing hard for the development of oil and mineral resources as a means of bringing wealth to the country and raising much needed revenues for social spending. However its insistence on pursuing massive resource projects on lands owned by indigenous communities, and in some of the most biodiverse areas on Earth, is causing growing tension across the country. Yasuni National Park is an area of incredible biodiversity which the Government has declared open to oil extraction. It is also home to indigenous communities including two groups living in voluntary isolation, the Tagaeri and Taromenane. However Yasuni is estimated to hold over 800 million barrels of oil worth some $18 billion, and its exploitation would yield Ecuador’s government revenues of $7 billion. The decision to exploit Yasuni’s oil has caused widespread outrage in the small Andean nation and 756,000 people signed an official petition demanding a referendum on whether the project should go ahead. To force a referendum 583,323 voters would have to sign, 5% of the electorate. However after a brief inspection of only four days, the government declared that only 359,762 of the 756,000 signatures were valid, claiming that the remainder were fakes and duplicates – and refused to hold the demanded referendum. There are loud calls declaring the process “fraudulent” and a failure of the Democratic process, and insistent demands that the electoral council publish the annulled signatures. Another Amazonian hotspot is the Sapara territory – 380,000 hectares of forest under the official tenure of the Sapara Nation, now threatened with Chinese oil exploration. Leaders have held rallies and raised awareness of their danger. Several Sapara leaders are now facing investigation by the Attorney General’s Office for terrorism and undermining the security of the country. Sapara leaders met this week to decide on future actions to save their forests. We are in communication with Gloria Ushigua, who is President of the Association of Sapara Women, Ashinwaka. The Sarayaku, who won a Human Rights case in the International Courts have also pledged to defend their lands against oil exploration. We are in communication with Jairo Santi, communicator for the Sarayaku. The government has designated further oil concessions in Aschuar territory, which the Aschuar People are resisting. 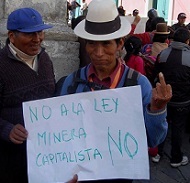 Two areas in Ecuador threatened by large open pit copper and gold mines. The longest struggle is at Intag in the North West of the country. In recent weeks the military and police have invaded the territory and made arrests. The situation is tense and the people are determined to protect their territory. In the South East of the country in the province of Morona-Santiago, the Central Ecuadorian Government have launched major mining concessions which are not acceptable to the Provincial Government who are committed to preserving ecosystems and biodiversity. The situation is particularly tense in the area of The Mirador Mine, an open pit copper and gold mine of enormous scale. The destruction of water sources, endemic species, and cultural life have brought this mine to the first ever Citizens Rights of Nature Ethics Tribunal. About two weeks ago a church and school were demolished in San Marcos de Tundayme in Zamora-Chinchipe by EcuaCorriente S.A (ECSA), a subsidiary of Corriente Resources, which has a troubled human rights history in the country. San Marcos is situated in an area to be submerged in toxic mine waste. The church was being used for Christian worship until it was destroyed. Last week workers locked themselves into the mine works citing Human Rights abuses. This is a very difficult situation exacerbated by Government irregularities in relation to both Human Rights and The Rights of Nature, both of which are incorporated into the Ecuadorian Constitution. 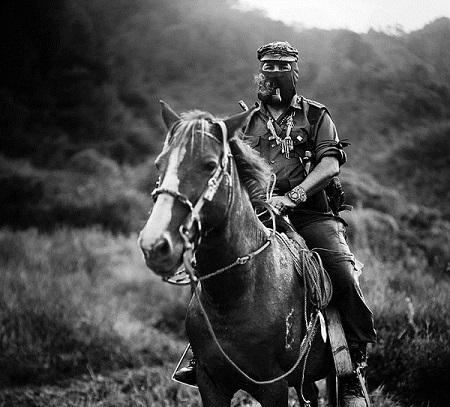 With growing spirit of rebellion across the country, the national mobilization of indigenous tribes, a National Security Alert in place, the disputed petition, and the government’s continued commitment to seeking development by resource extraction, the tension in Ecuador is palpable. All indicators portray the picture of a country heading into crisis. David Dene is co-founder of Protect Ecuador. This article is based on an original story in EcoHustler.